Workshop description: Learn the tips and techniques to turn a collection of T-Shirts into a throw-size quilt approximately 56” x 72”. Rotary Cutter Rulers; 5/6” x 24”, 12” x 12” or (12 ½” x 12 ½”), or 15” x 15” – this is the one I use most often and I will bring mine, you may use if you wish. Digital Camera or camera phone – to audition t-shirt block arrangements. 5 ½ yards of Pellon 931TD Medium OR Heavyweight fusible interfacing (I have tried them ALL and I like this one the best. At least 9 to 12 T-Shirts (minimum) with nice, large graphics (fewer if both sides of t-shirt has graphics you want to use. ) 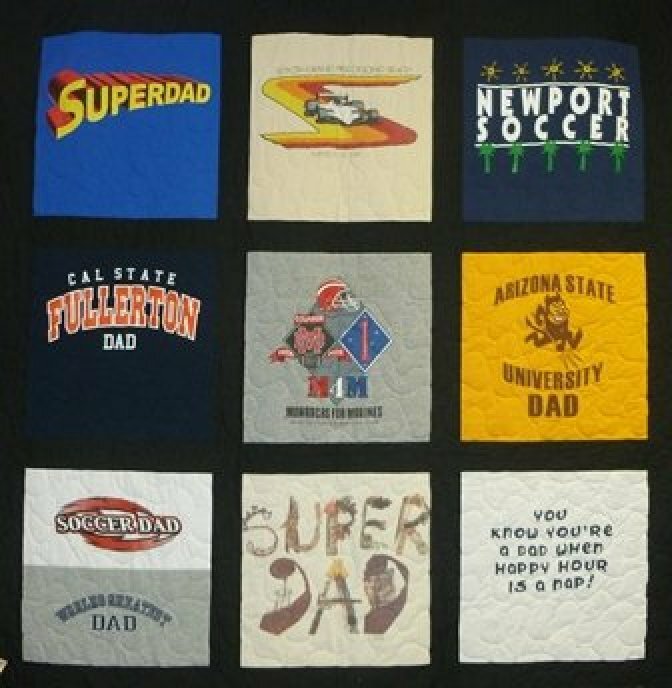 Note: You can make a quilt with as few as 4 T-Shirts if you just want to learn the process. IMPORTANT! DO NOT PRE-CUT YOUR T-SHIRTS PRIOR TO THE WORKSHOP!